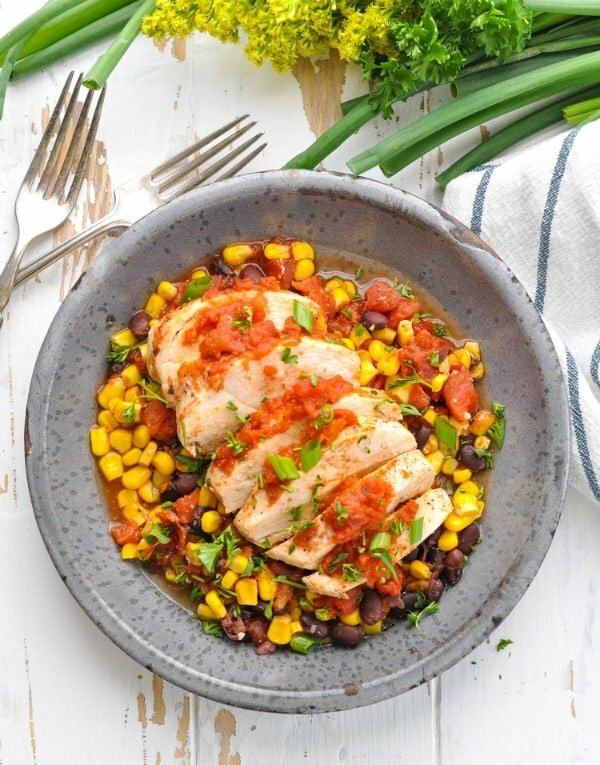 This easy Salsa Chicken requires just one dish and about 10 minutes of prep for a nutritious and family-friendly dinner! You asked for it, so here it is: a healthy, dump-and-bake dinner with zero points! 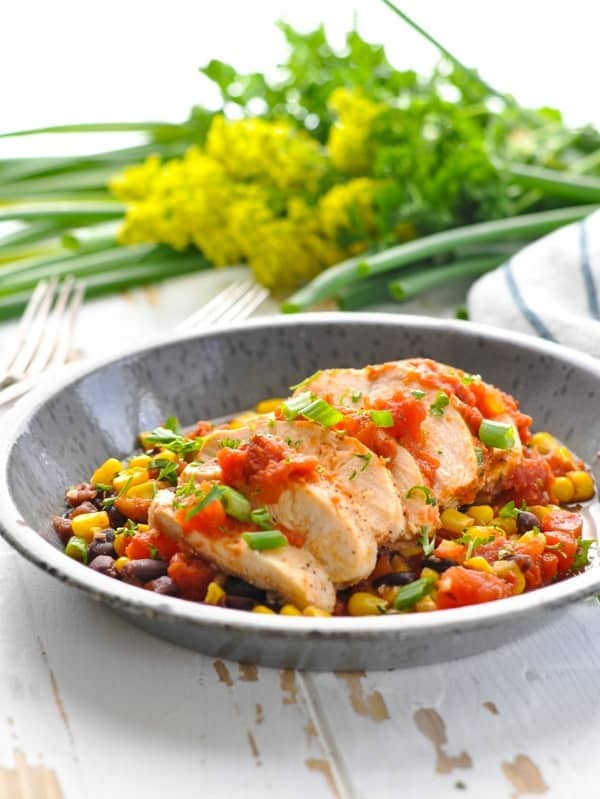 This easy Salsa Chicken requires just one dish and about 10 minutes of prep for a nutritious and family-friendly dinner! Whether you serve your chicken in tacos, over rice, on a salad, in a bowl, or stuffed inside quesadillas, the options are endless. This is truly a meal that makes everyone at the table happy. I’m not exaggerating when I say that every.single.day. I receive emails from lovely readers with almost identical pleas for help. Affordable options that won’t blow your grocery budget. And you know what? 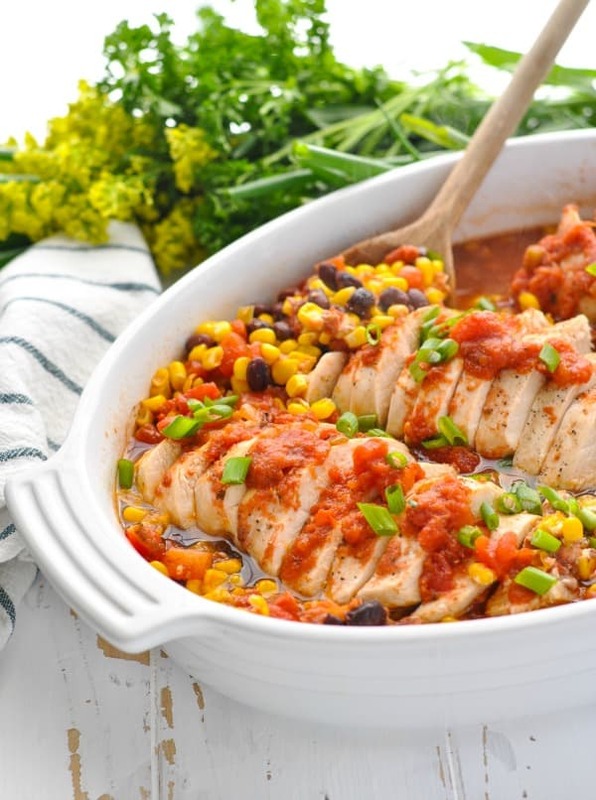 This Salsa Chicken checks ALL of the boxes! I’ve never done Weight Watchers, and I don’t know much about how the system works, but I do know that a lot of my readers are finding success with the program. You’re always looking for new ways to incorporate nutritious low-points dinners into your weekly meal plan, and I’m excited to help you out! 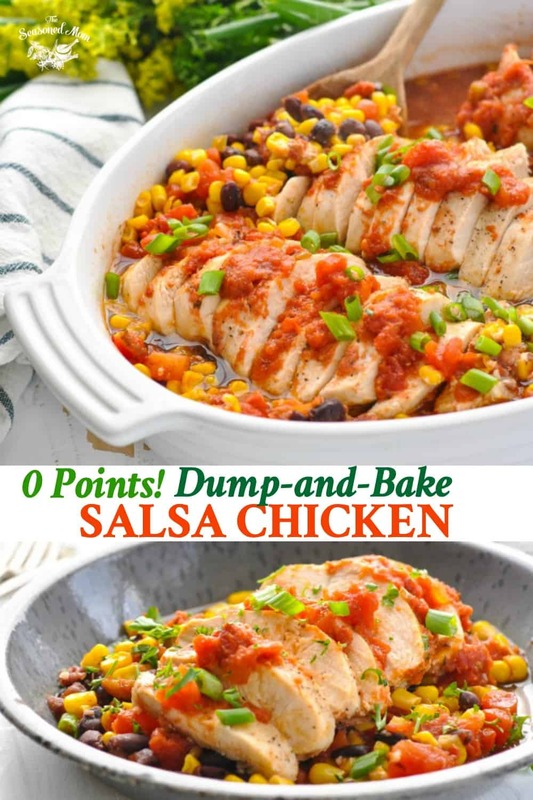 I’ve been preparing a version of this Salsa Chicken for my own family for years, so when I realized that the few ingredients required to make it were all ZERO POINTS on the flexible Weight Watchers list, I knew that I had to share it with you. Whether you’re on Weight Watchers or not, I know that you’re going to love this meal. It’s approved by me, my husband, and our 3 kiddos! 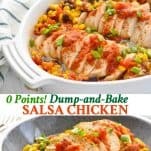 While my Dump-and-Bake Salsa Chicken is obviously a nutritious, low-calorie dish, it’s definitely not lacking in flavor! Step 1: Stir together frozen corn, black beans, diced tomatoes, and salsa in a dish, along with minced garlic and cumin. Step 2: Place your chicken breasts on top, and season with salt and pepper. Step 3: Pour additional salsa on top of the chicken; cover; and bake for 45-60 minutes (or until your chicken is done). In the end, you’ll have zesty, flavorful, tender, and juicy meat that serves as the base for a variety of easy dinners. In soft tacos! Stuff the chicken, salsa, corn, and beans into warm tortillas. Top with shredded cheddar cheese, lettuce, sour cream, green onions, olives, guacamole, or any of your other favorite toppings. In burrito bowls! 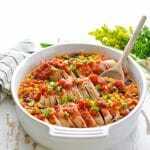 Fill a bowl with rice (or cauliflower rice) and top it with the salsa chicken. Add shredded cheddar cheese, lettuce, sour cream, green onions, olives, guacamole, or any of your other favorite fixin’s. In quesadillas! Slice (or shred) the chicken and stuff it inside quesadillas. 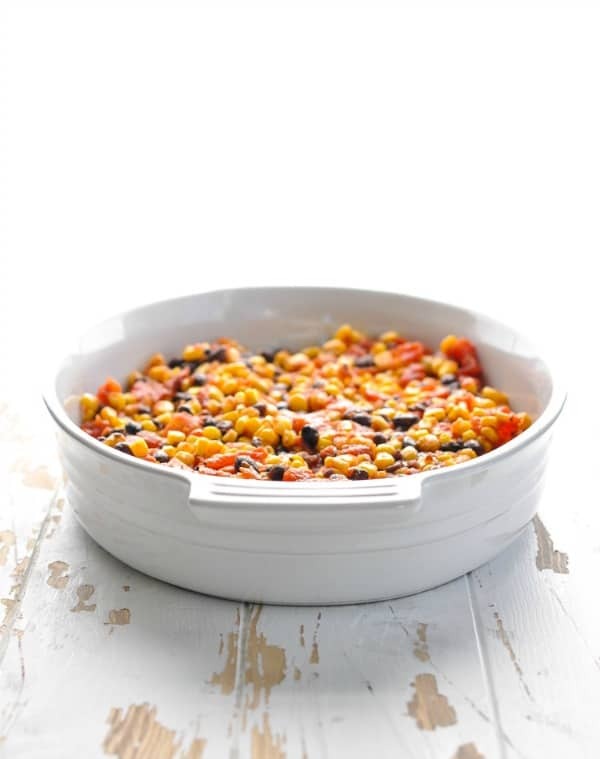 Use the corn and bean salsa as a delicious topping just before serving. On taco salad! Keep it really light and enjoy the salsa chicken over a bed of crispy romaine. Add toppings if you like, but it’s certainly not necessary! I hope that your family loves this meal as much as we do, and that it makes your healthy lifestyle just a wee bit easier! For a quicker cooking time, cut larger chicken breasts in half lengthwise to create thinner pieces of meat. Thin, small chicken breasts will be done in about 25-30 minutes. Prepare this dinner in the slow cooker! Just place the chicken breast in the bottom of a Crock Pot. Add the remaining ingredients on top. Cover and cook on LOW for 4-6 hours or on HIGH for 2-3 hours. Cooking Just for Two? Cut all of the ingredients in half and prepare the recipe in an 8-inch square baking dish. The cooking time will remain the same. Spray a large (9 x 13-inch) baking dish with cooking spray. 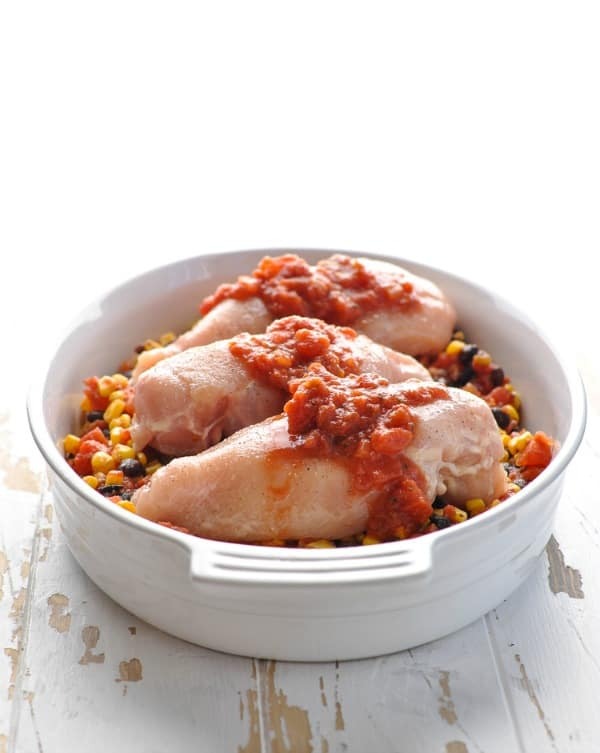 In the prepared dish, stir together frozen corn, black beans, diced tomatoes, ½ cup of salsa, garlic, and cumin. Place chicken on top of corn mixture. Season chicken with salt and pepper, to taste. Pour remaining ½ cup of salsa over chicken. Cover tightly with foil and bake for approximately 45-60 minutes, or until internal temperature of chicken reaches 165 degrees F. The total length of cooking time will vary depending on the size of your chicken breasts. Remove chicken from dish and slice (or shred with two forks). Return to dish, stir to combine, and serve. In burrito bowls! 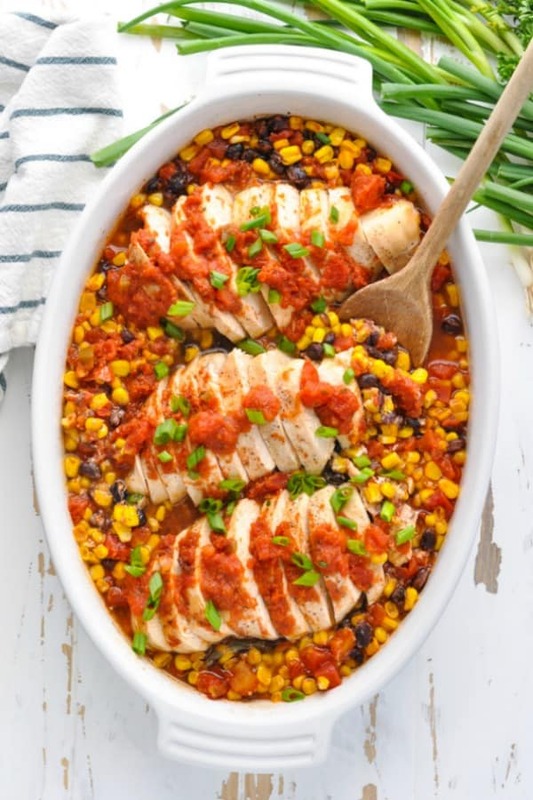 Fill a bowl with rice (or cauliflower rice) and top it with the salsa chicken. Add shredded cheddar cheese, lettuce, sour cream, green onions, olives, guacamole, or any of your other favorite fixin's. On taco salad! Keep it really light and enjoy the salsa chicken over a bed of crispy romaine. Add toppings if you like, but it's certainly not necessary! I’m not a huge fan of salsa, but my kids are, so this looks like one we should try. I’d like to try it in the crock pot. Do you recommend maybe on low for 2-3 hours or would I just end up with very mushy corn/beans/tomatoes? We rarely use salsa because we always have leftovers – but now I know what to do with it! I think we’ll have to have salsa on our tacos tonight and then make this later in the week! You’ll love this dish, Kristy! Thank you! 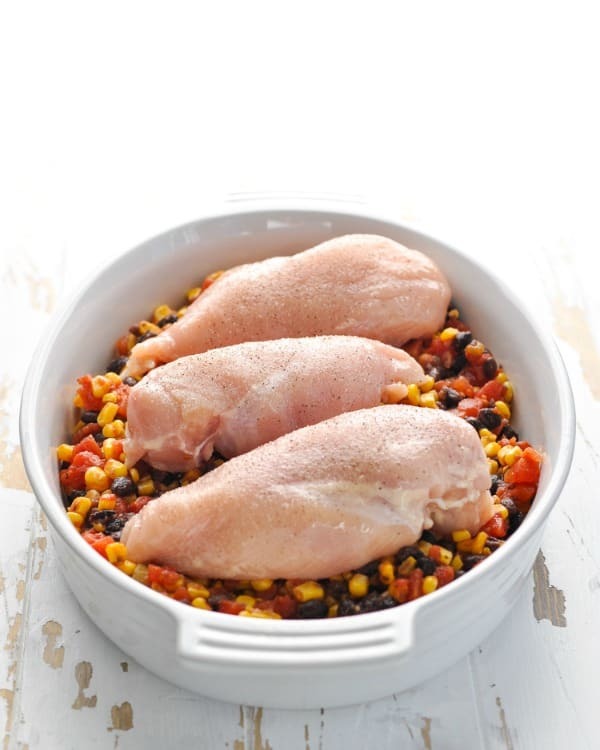 Wondering if you can freeze this meal in its raw condition and later, thaw and bake? Hi, Cindy! Yes! This is a perfect freezer meal! Thank you for this quick put together chicken recipe. I’m making it tonight. Sounds wonderful. Thanks for saving dinnertime tonight Blair!! I got home exhausted from work, with my husband and hour behind me, also exhausted from work. Our 19.5 month old toddler needed supper, a bath, etc etc. What to make for dinner?! I had a look through your chicken recipes and this one jumped out. Lo and behold, I had all the ingredients! We’ve not even eaten it yet, but it smells so good I know it’s going to be delicious. Quick, easy, healthy: exactly what we needed on this tired, hungry, busy summer weeknight. Thank you so much!!! I am confused. The ingredients here are all zero points, but the nutritional facts below come up to 7 points. Are you able to provide a breakdown of where the totals came from? I cooked my meal for 50 mins and my chicken was no where to be done. It’s going to cook uncovered for 25 more minutes. I pounded out my chicken too. Very strange to me. I have made this twice and it has always taken considerably more than 45-60 minutes. Maybe wrong oven temp? I butterflied the chicken breast last time and still needed to cooked them for another 30 minutes uncovered. What can you use instead of corn? If you are unable to eat corn, what would you suggest using? I cook for my parents every week, I am thinking of putting this together in the morning and having my mom get to my house before I get home from work to throw in the oven — this way she doesn’t have to do any of the work and it’s ready sooner rather than waiting to get home and put it together. Do you think that would be ok?? Yes! That will work perfectly! Enjoy, Michele! I have just made this and it was delicious – I used sweetcorn from our farm that I froze way back in summer, and Quorn because my partner is vegetarian. It worked really well! Sounds perfect, Joanne! Thanks so much! Do you think you could cook trice directly IN this recipe while it’s in the oven? Is there enough liquid? Thanks ! Hi – I would love to make this tonight, I have thin slice chicken cutlets from Wegmans. How long do you think I should try cooking for? They are not as thick as a chicken breast. Is your recipe for pounded even chicken breasts? Hi, Tara! The thinner chicken cutlets will bake much faster than the thicker chicken breasts that I used. I would start with about 30 minutes, check the meat, and then return it to the oven if it’s not quite done at that point. Enjoy! Wonderful! That sounds delicious, Jane! Can this be cooked in an Instant Pot pressure cooker? So glad I found this recipe! My husband (the picky eater) likes it! Of course I had to leave out the black beans… but its still delicious. I add a big squeeze of lime and some cilantro before serving. That’s wonderful! Thank you, Ellen! Blair, could you us chicken tenders for this meal? Would make it eazy to put in tortillas when done.